In today’s market, for the cost of a pre-built spec home, you can build a custom home instead - and why wouldn’t you? With historically low interest rates, advancements in energy efficiency, and the option of new furnishings and appliances that reflect your personal taste, it just makes sense to build a new home that reflects your dreams…not someone else’s. With Silverstein Construction, the process couldn’t be easier. Select your home site from the lot map below and begin the process of owning a new home. 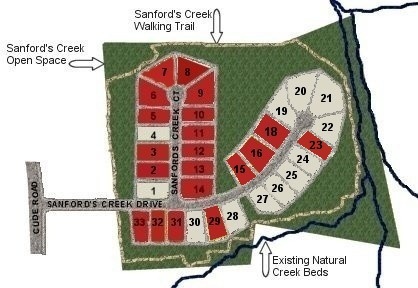 Sanford’s Creek Phase II has just opened with one custom home available and 11 lots available for custom homes. There are also 2 lots still available in Phase I for custom homes. Please contact us to reserve a lot in this exciting new subdivision in the Northwest Guilford High School district.